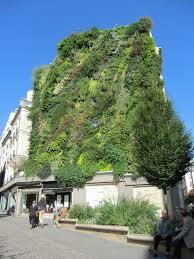 If we lived in Paris, we’d choose the 2nd Arrondissement. 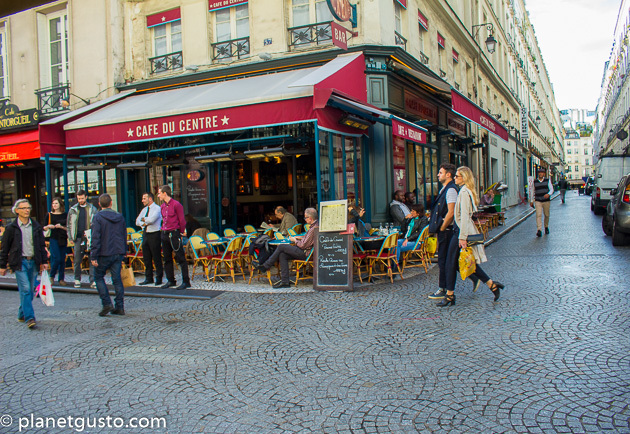 The 2nd, in central Paris, just north of the Les Halles district, is definitely a locals’ neighborhood with little tourist influence, yet it’s within walking distance many places tourists want to see. 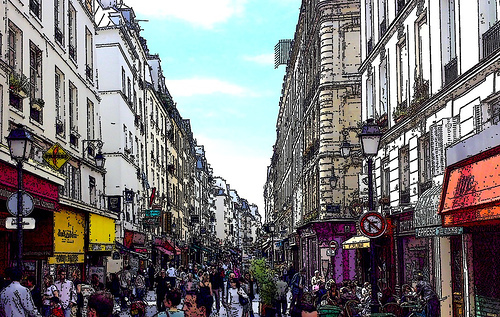 At the center is Rue Montrogueil, the quintessential daydream of a busy Parisian market street packed with every imaginable boulangerie, meat, fish, cheese, produce, wine or hardware shop, everything that supports a neighorhood. And it buzzes with activity day and night. 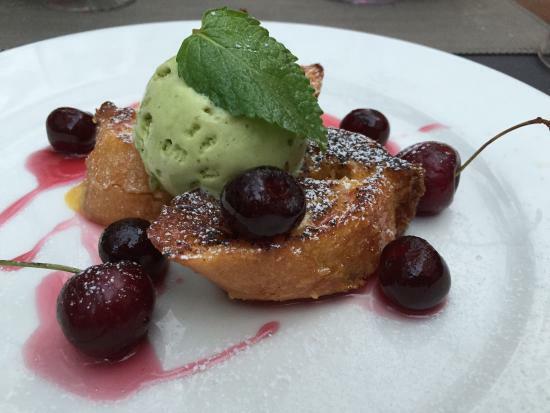 Completing the Paris fantasy come true, there are dozens of cafes and resaturants from the “pas cher” Paristanbul, Turkish take out down the block from our flat to “tres chic” Frenchie, the newest foodie prix fixe emporium, just around the corner. Susan and I have been to Paris together six times over almost 15 years and stayed all over, but for the past two trips, we’ve landed here in the same flat on Les Petits Careaux overlooking L’Oasis Abokir. And now this is our home in Paris. The restaurants, the street markets, speciality food shops, the whole street scene of Paris, all are as vibrant as ever, but, for us, these days more relaxing, pleasant, and familiar– less exotic. In the 70’s and 80’s American travelers visited Europe and found so much that they had never encountered. They came back saying, “We can do that!” And they did. In Oakland, we have so much of what we loved from our early trips to Europe, admittedly with an American style. 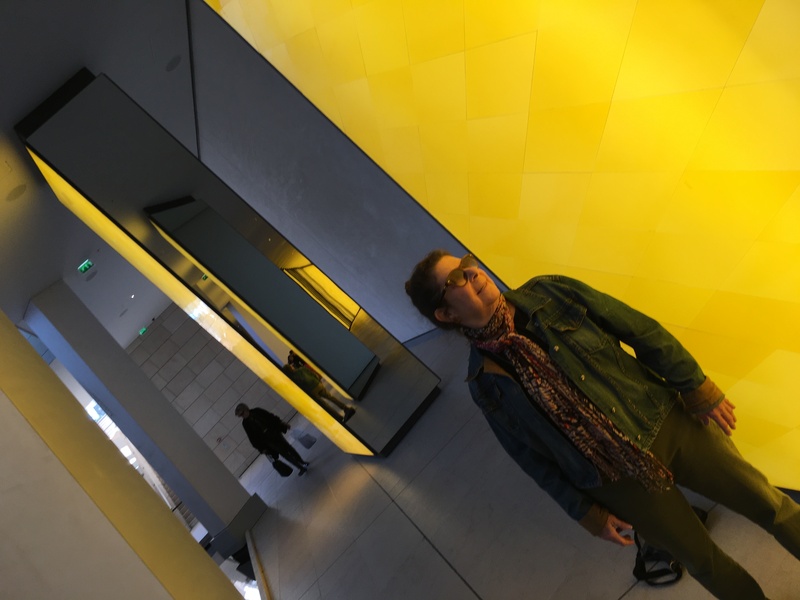 When you tell Parisians, especially the young, that you’re from Oakland, the reaction is, “Oui, I know about Oakland and can’t wait to visit there.” The world is a smaller more comfortable place. And yet we keep going back to Paris. We certainly go back for the art and attractions, the gorgeous food and the wine, for the same eneffable romance that has always drawn people (How you gonna keep em down on the farm??). The perfect stroll with the perfect cafe always waiting to be discovered. The perfect bridge with the perfect kiss against the railing, even for oldies like us. We had our first European kiss on a freezing night in the middle of the bridge to Ile Staint-Louis, and we always smile when we pass that spot. There’s Hemingway and his Paris wife, Sarte and Simone, Picasso, Monet, Gertrude Stein…they linger there charging the air with possibility. We’ve been to the well known museums many times, and we go the the D’Orsay, every time, and are always glad we did. But when we arrived in Paris this time, as we do at home, we looked to see what special exhbits were in town and were rewarded with severaly really interesting and exceptional shows at museums that we had not previously discovered. 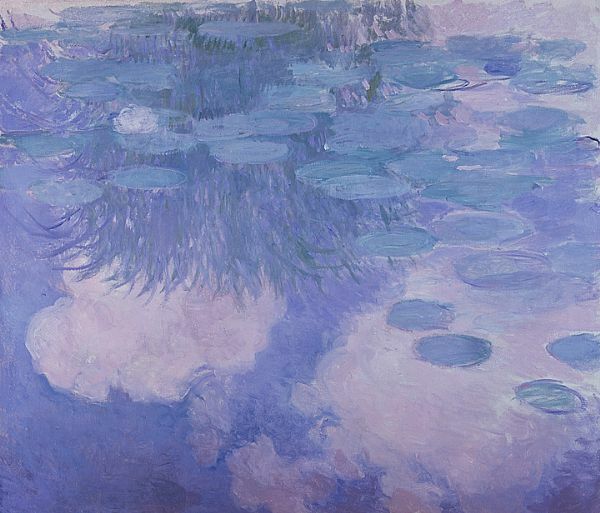 The Museum Marmottan Monet, housed in the former hunting lodge of a 19th Century Duc, adjacent to the Bois de Boulogne, has a surprising large and excellent resident Monet exhibit, which we had never heard about before. 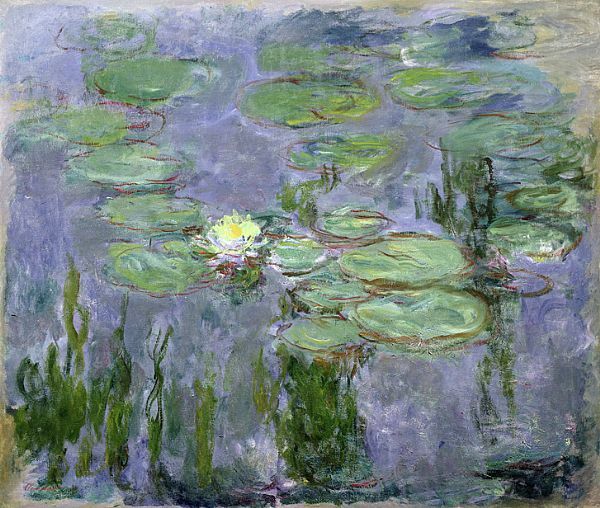 The paintings trace Monet’s evolution from an Impressionist in his early years to an almost abstract colorist in his later years. 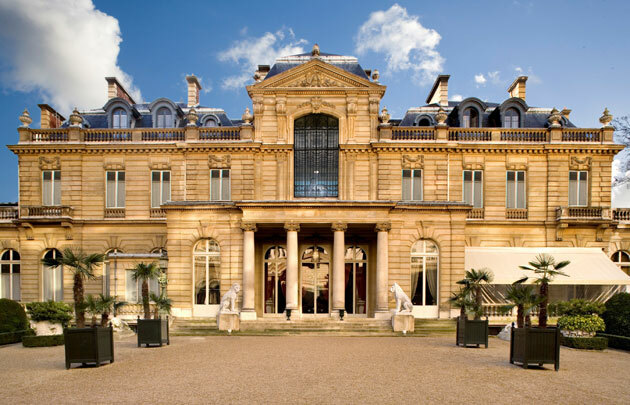 The Musee Jacquemart-Andre, located in the 8th Arrondissement, in an even bigger grand mansion, had an exhibit of Rembrandt’s work, including twenty paintings and thirty drawings by the Dutch master, made possible by exceptional loans from museums from throught the world. 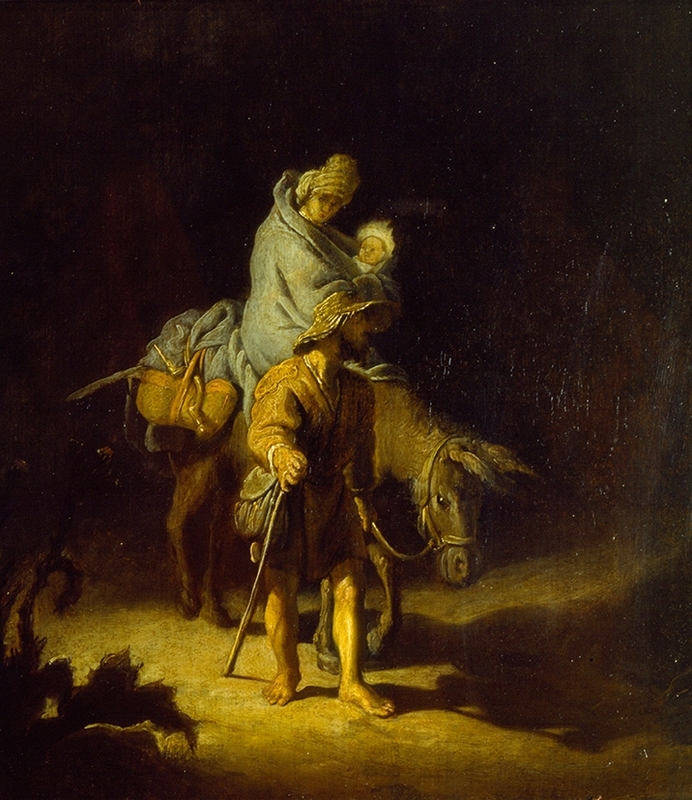 We were both transported by this event that protrayed the depth and breadth of Rembrandt’s genius in a way we had never seen before all in one place. We had not bought tickets in advance so were in a rather slow moving line in the covered coach entrance to the mansion. Along the far wall were displays telling the story of the house and it’s owners. We stepped a little out of the line to get a better view of the small print and didn’t notice the line move forward about ten feet. When we turned around, we found the couple, a middle aged man and a young woman, behind us had simple moved ahead and taken our place. Art appreciation in Paris is apparently more cutthroat than we had anticipated! The people behind them left a space for us and we exchanged bemused smiles. Not really an issue, only slightly annoying, unless, of course, that couple got the last tickets. Then, we had to endure a non-stop 40 minute monologue from the man pontificating about art, which even in French, we could tell was tedious. More eye rolling and ackward smiles from the gracious neighbors behind us. We passed the couple from time to time in the exhibit, he still droning on. 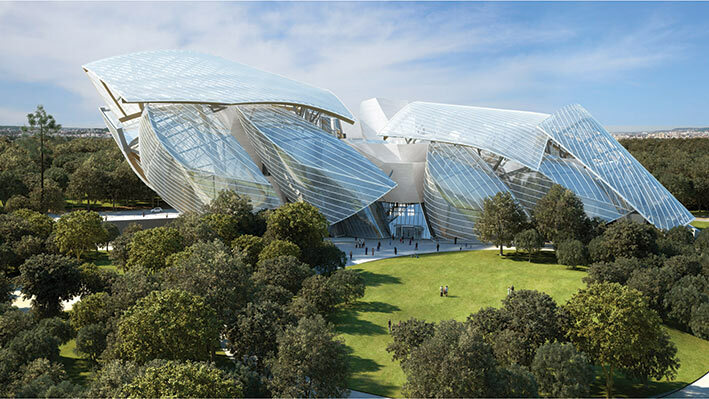 We ventured out to the Bois de Boulogne to visit the new Foundation Louis Vuitton museum, just to see the architecture, even though we knew that all the inside galleries were closed while they were mounting a new show. 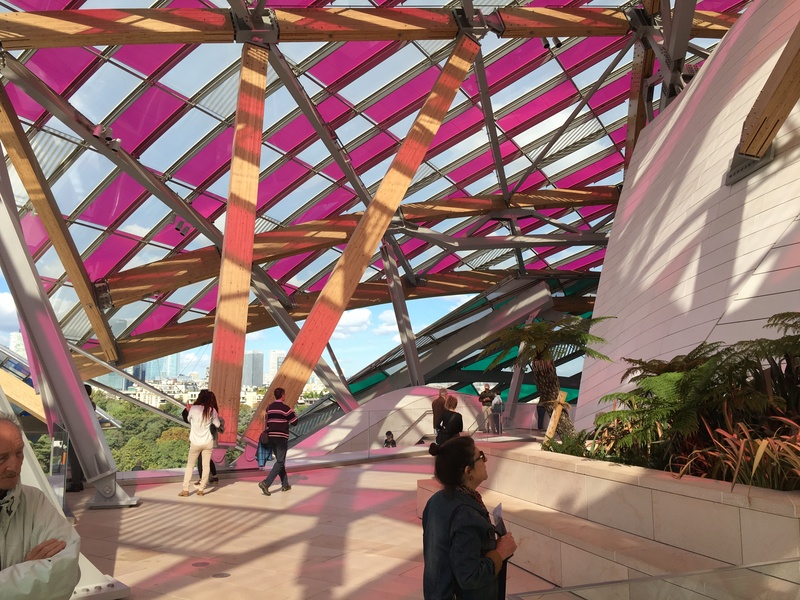 Designed by Frank Geary, this museum is dedicated to modern art and architecture. 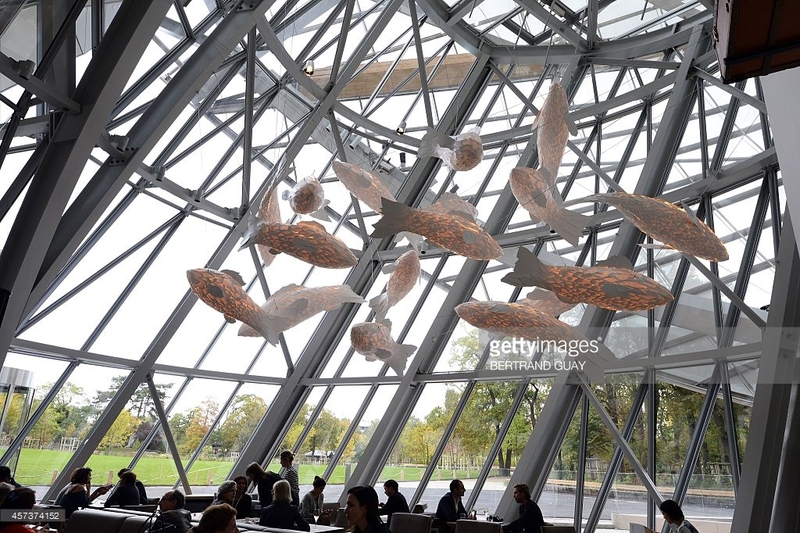 We had a leisurely, though somewhat expensive, lunch at the museum restaurant, festooned with fascinating fish mobiles. The couple next to us seemed like an exhibit of the French museum patron. They were older, at least in their late 70’s, with an aire of aristocrocy that we don’t often encounter. Both were very attractive and impeccably and somewhat formally dressed. Certainly compared to my T-shirt. And finally we can’t neglect the art on our doorstep. Our flat overlooked L’Oasis D’Abokir, Patrick Bland’s six story veritcal garden that has been there since 2013 and is more lush each year. 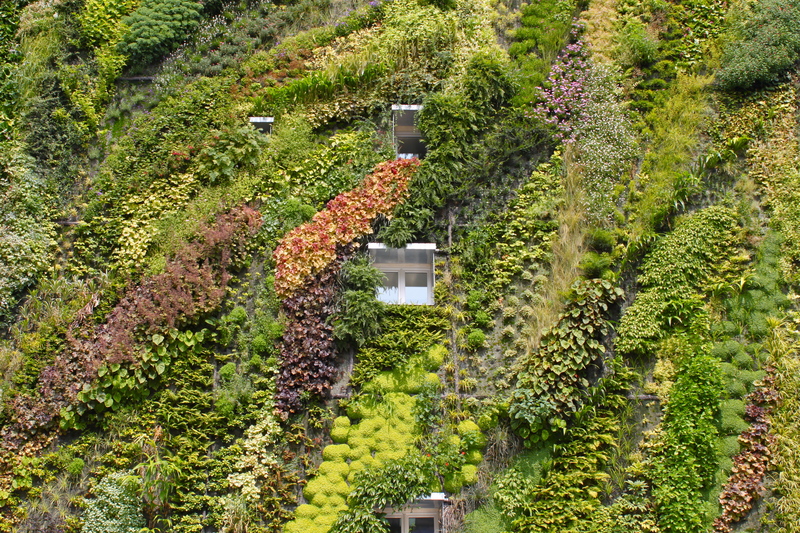 Bland is one of the world’s foremost practioners of vertical gardens and since his office is right around the corner, I think this installation gets special attention. Our special foturne is that this is the view from our terrace, over breakfast, a glass of wine or into the night for dinner. So now we’ll get down to the serious stuff, food. This trip we didn’t search out special “listed” restaurants. Mostly we ate at local cafes and restaurants in the neighborhood, cooked a little at home and enjoyed make believing we were locals. Like many things Parisian, this becomes a little complicated. To us, as we walk down the street, we see a whole line of cafes. But the French eye sees a cafe or a bistro or a brasserie. To further confuse the outlanders, some advertise themselves as a cafe brasserie, and I’m still trying to absorb the fine distinctions. We had just arrived in Paris on a flight from Palermo; we made out way to our flat and checked in, tired and hungry (If you’ve read all the posts, you’ve probably noticed that our being hungry and/or wanting a glass of wine is a constant theme). Making our way down Rue Montrogueil with no plan, we passed several places that didn’t strike our fancy; then we spied a cafe with an open outside table and we felt the perfect vibe. 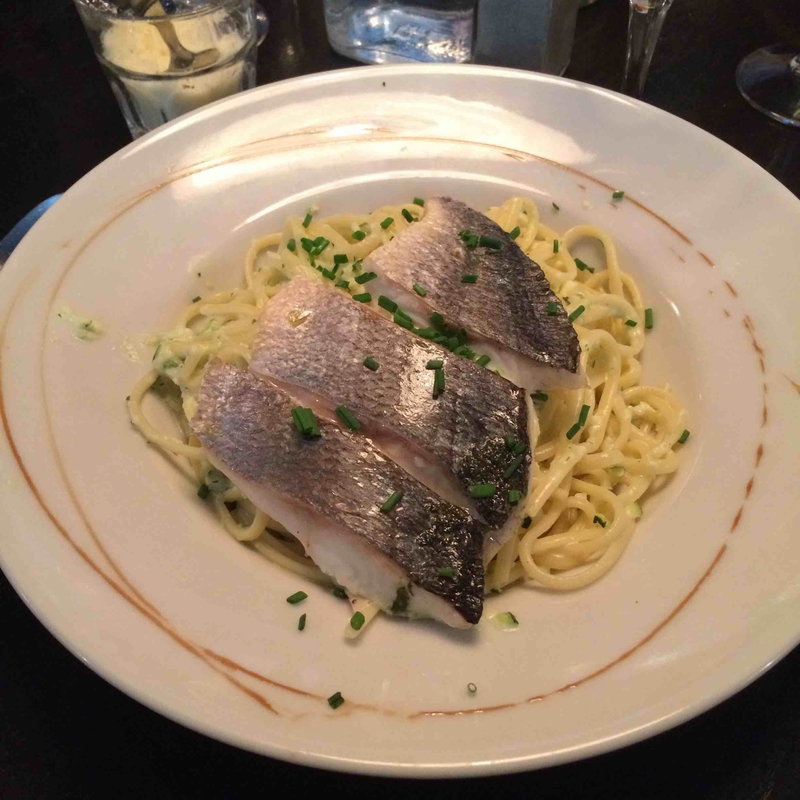 Cafe du Centre was just what we wanted, with a completely traditional and very good Paris cafe menu. This is a cafe. Outdoor tables with an array of people having coffee, earnestly talking, reading the paper or having a meal. 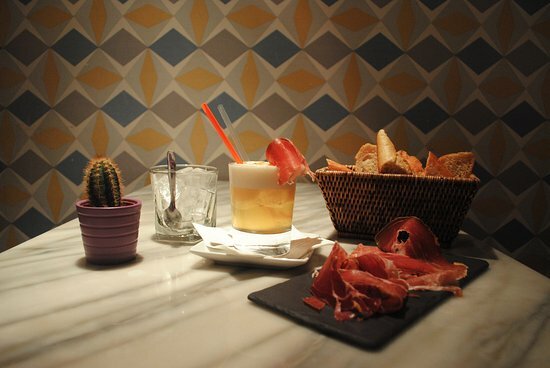 They have a classic and completely predictable and delicious cafe menu, open from 6am to 2am. 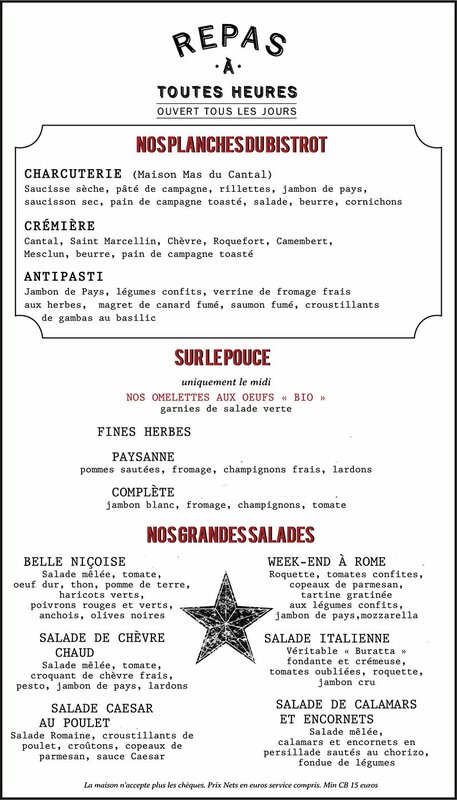 And there’s no question that this a Paris cafe menu even if it’s hard to read. That’s OK, you already know what’s on it. I might add that sitting at outdoor tables is the essential ingredient, not the food. The joy of sitting, having a coffee or a drink and a meal and watching Paris wander by, or simply basking in the hazy Parisian sun, cannot be overstated. Our warning is that Paris still allows smokers at outdoor tables. We can remember cities in America and other places in Europe where they said that people simply wouldn’t go out if they couldn’t smoke. Mon dieu, c’est impossible!!! But it wasn’t true and even in Paris, one day, smoking will be banned at outdoor tables and the smokers will be relegated to their corners of shame, down the street. 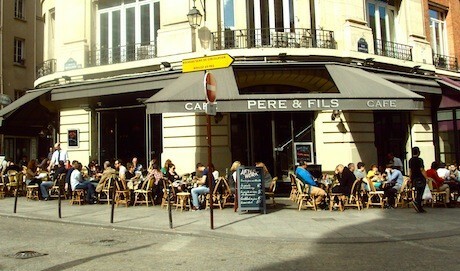 Cafe Pere et Fils advertises itself at a Cafe – Bar – Brasserie. OMG we’ve added Bar into the equation. You can see how one becomes confused. The same outdoor tables, you say. 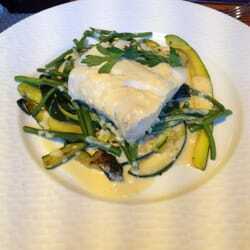 But the menu is far more diverse, with a more sophisticated wine list. The still manage to have a salad Nicoise, but nary an omelette nor a croquet monsieur in sight. 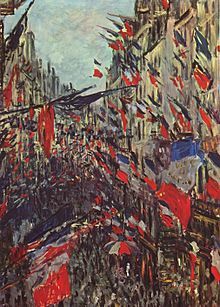 We had planned to walk from 0ur flat in the 2nd to the Marmottan Monet in the 16th, and, with Siri in some kind of pouting mode, we had wandered to and fro on our journey. Somewhere in 7th, just across from the Assembly National, we plopped down in an empty cafe, on a corner, overlooking a large plaza. We were done, for the time being. This place is in a much more ritzy, Left Bank, neighborhood, and the waiter seemed to size us up immediately and was quite aloof. While we were enjoying our glass of wine, one by one, or in groups, men and women in suits streamed into the cafe. We were soon surrounded by what seemed to be the entire French Assembly. There were politicians everywhere, each with the obligatory French flag lapel pin. I wish my French was better so I might be party to some State secret. So, this was a Brasserie. From the street, the same outdoor tables, but with a much wider menu and a little remnant of that old fashion Parisian haughtiness. Escargot were on Susan’s list for this trip, which, while they are definitively French, aren’t on many menus. 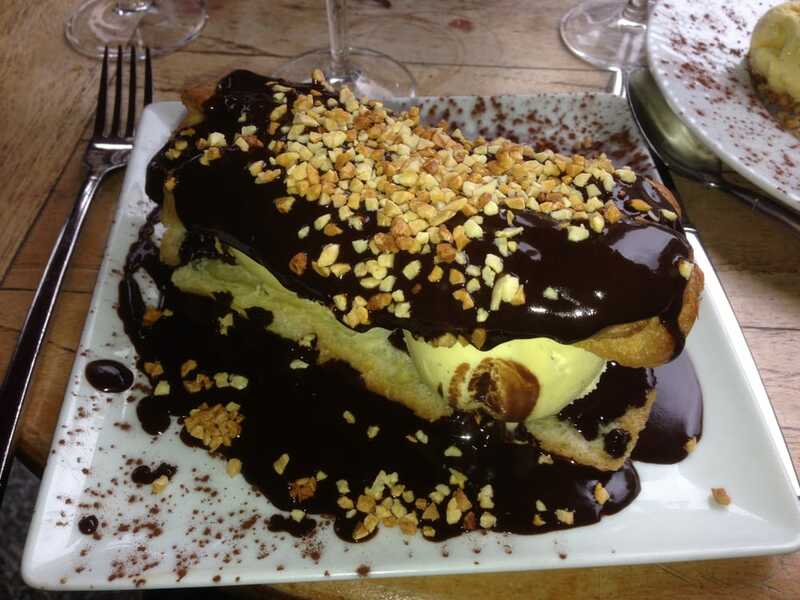 Without searching, we had noticed, L’Escargot Mongtrogueil in our neighborhood, on the lower reaches of Rue Montrogueil. We didn’t know that that this was, in fact, an actual tourist attraction, established in 1832, one of the oldest restaurants in Paris. We stopped in for an early snail snack, around 5pm, thinking it would be quiet, only to find the place slammed by a tourist group, and we just managed to get a table in the corner near the hostess station. 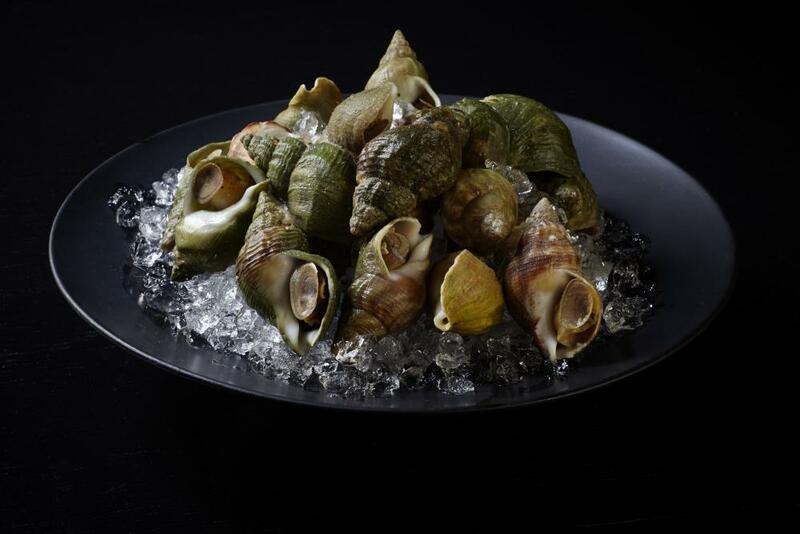 The escargot were very good, among the best in Paris we are told, and we also greatly enjoyed our conversation with the hostess lamenting the tourist crush. The tables around us were filled with Chinese tourists who seemed frozen, peering at an indecipherable menu with their phones out trying to translate. We offered our assistance a few times, trying to steer them into a menu choice. 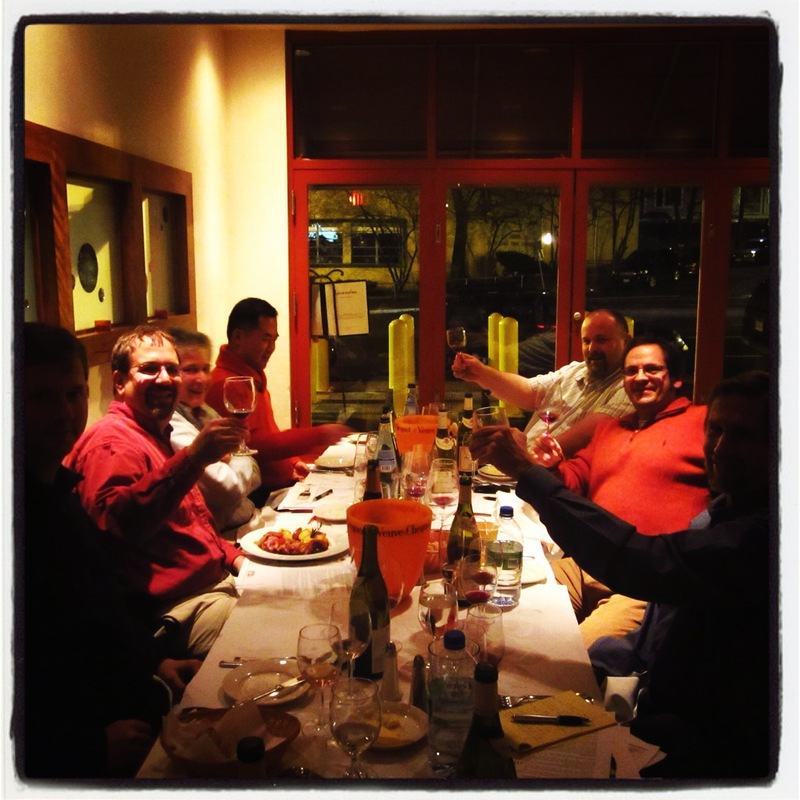 They and the restaurant staff were grateful, and we felt like locals. 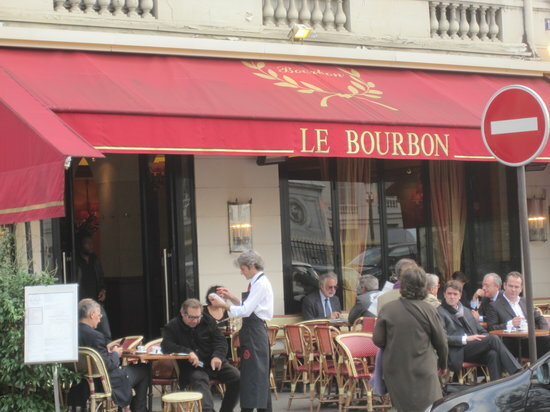 In addtion to cafes, bistros and brasseries, there are bars and restaurants. I’ve completely lost track of the distinction. Here are a few places, I’ll just call them places, in our neighborhood. Actually, a bar is just bar, even in France. Just down the street was Caminito, a neighborhood bar with a limited menu of good bar snacks. 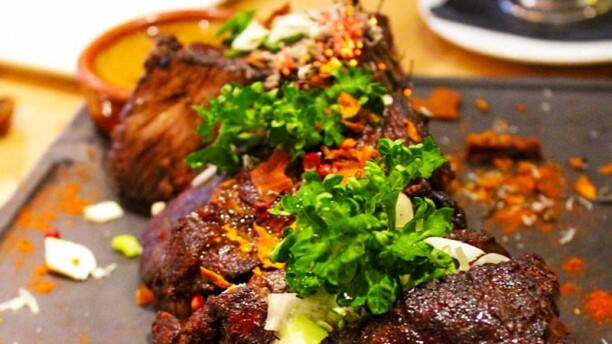 And by limited menu, since they are Argentines, that incluces a big hunk of beef. We went there a few times for an early drink. The outdoor tables filled from the time the bar opened. In the late afternoon, we noticed groups of friends, often with babies in carriages, lounging over a beer or glass of wine. Some nights, the outside tables were full into the wee hours. When we’re home, and when we’re having cocktails, which, you may not believe, is not every night, we drink martinis. So, on this trip, we made it our mission to teach Parisian bartenders how to make a good martini. Our first effort at ordering a martini resulted in a glass of sweet vermouth, Martini & Rossi. No we explained, like James Bond, shaken not stirred. Generally the bartenders weren’t receptive, one saying if we had to have a martini we shouldn’t have come to Paris. The bartenderer at Caminito was very receptive and wanted to learn just how to do it, though we all agreed that in most places we should just order vodka or gin on the rocks and avoid the confusion. I know that if we lived here, this would be our local. 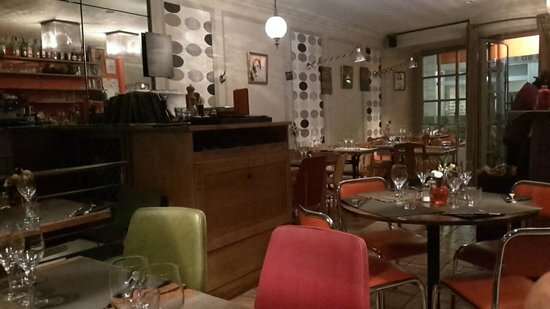 This is a new style Paris restaurant, very informal and hip, more like what you would find in Oakland. It’s just downsatirs from our flat, owned by the son of our host. There are no menus, just a big blackboard written in a french scrawl that our waiter had to lug to each table and prop up on a chair for diners to use for ordering. There is a friendly and casual vibe, as everybody there seemed to know each other or the staff, and by the time we left the place was full. The menu, once they helped translate the blackboard, was creative, very well prepared and presented and nothing like old fashioned classic French Restaurant fare, which now seems to rich and fattening to us. We’ll be back. Our last night of a long trip, we were tempted to get take-away Paristanbul, the Turkish place down the block, and a bottle of wine. But we started late and the Turkish place was already closed as were all the wine shops. So we had a cocktail at Caminito across the street, always a good way to absorb restaurant dissapointment and regroup. We wandered down the sidestreets off Rue Montrogueil passing on this place or that and finally landed in Mauvais Reputation. It was almost empty, but the menu looked interesting. Like Joseph & Lucien this is a solidly new wave Paris restaurant, though the menu was a little more limited, sophisticated and expensive, but by no means out of reach. Our waiter was helpful and friendly. We had been willing to settle for take-out, but this turned out to be the perfect special meal for our last night. We decided to bring home several recipes from our trip. 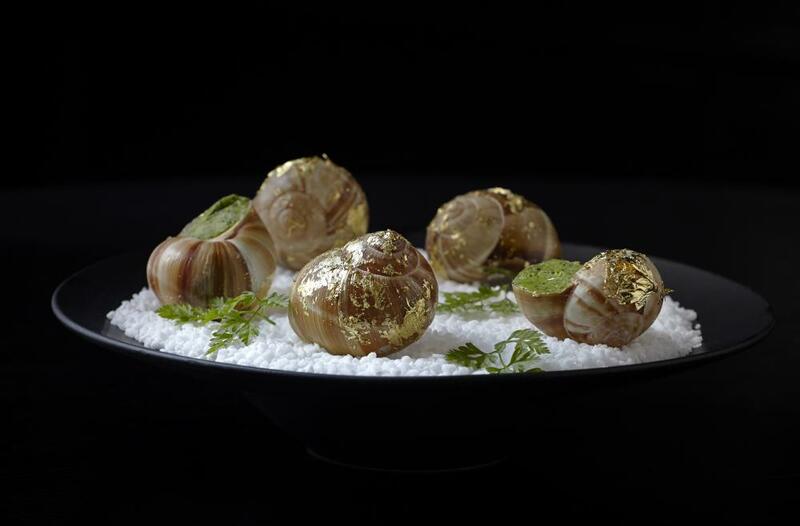 Would we try to capture one of those wonderful and innovative dishes from Joshep & Lucien or Mauvis reputation, or even try escargot, which I am told involves turning the live snails loose in cornmeal to clean themselves? 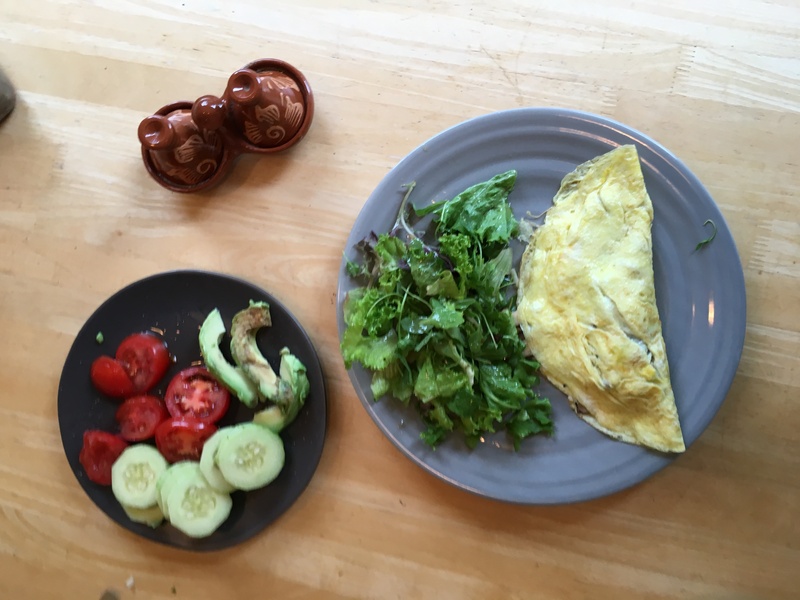 Non, we decided to go old school and simple and what’s more universally Parisian than the classic french omelet and salade nicoise. You can find many recipes in cookbooks and on the internet, but I’m going try to navigate those a little and make some suggestions. I thought this would be an easy task. I already knew my way around an omelet. All I needed to do was tune it up a little. Here is what I learned about omelets in Paris. It’s not about the filling, though that opens up a whole other discussion. it’s about getting the eggs just right and there’s more than one opinon of what constitutes, just right. The Classic French Omelet isn’t the omelet that most Americans are used to. There is the French Omelet and the American Omelet. The difference is both obious and subtle and there are a lot of opinions about technique. And even in France, you often get the American version. Then there’s the Country French Omelet which is a whole different thing, closer to an Italian Omelet or Frittata. 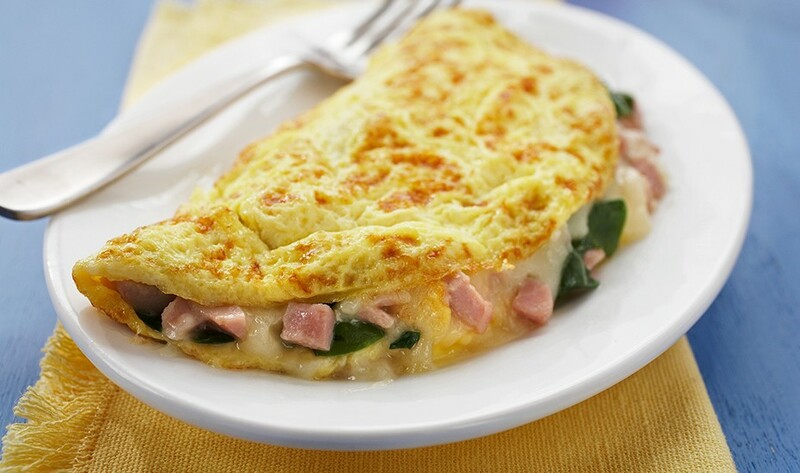 Written recipes are fine for most things, but with omelets, a demonstration is essential. It’s all about technique. Its hard to find a better example of how to make a French Omelet than this video by Jacque Pepin, After searching further, I also found this video from Food Tube by Jamie Oliver which is a little less … French. 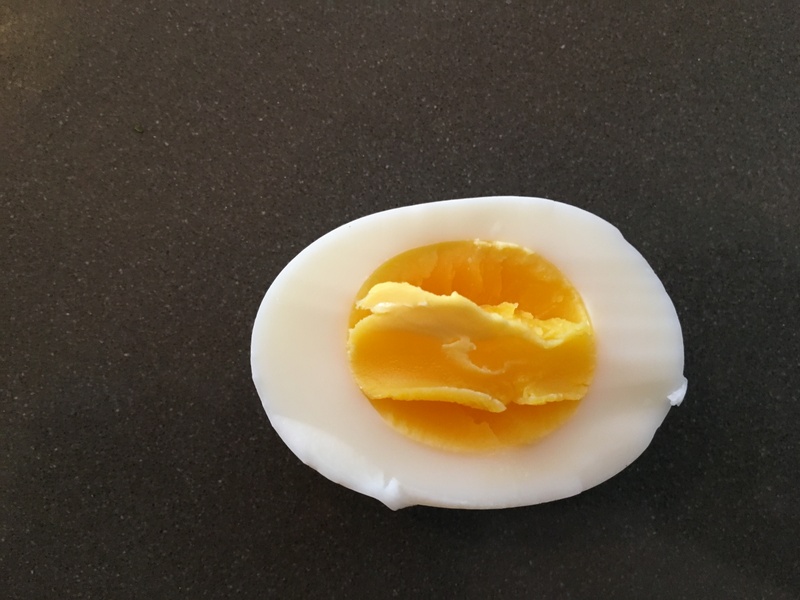 The goal is to get the omelet on the plate with the outiside golden yellow or slightly browned, a different technique for each, and the inside a creamy soft delight. Of course, if you find soft, slightly runny, eggs vaguely menacing, it’s easy, just cook the omelet more. I’ve made more than a dozen omelets in the test kitchen so far and I’m only scratching the surface of different options and getting it just right … every time. 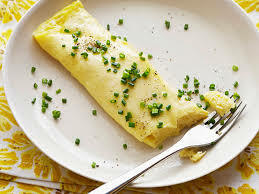 As for filling, Jacque Pepin seems to favor the plain herb omelet. Jamie Oliver ventures into other fillings. The first rule is that the filling must already be cooked and warm. In my research I’ve fallen into a wormhole of dozens of varieties of wonderful tasty mushrooms. 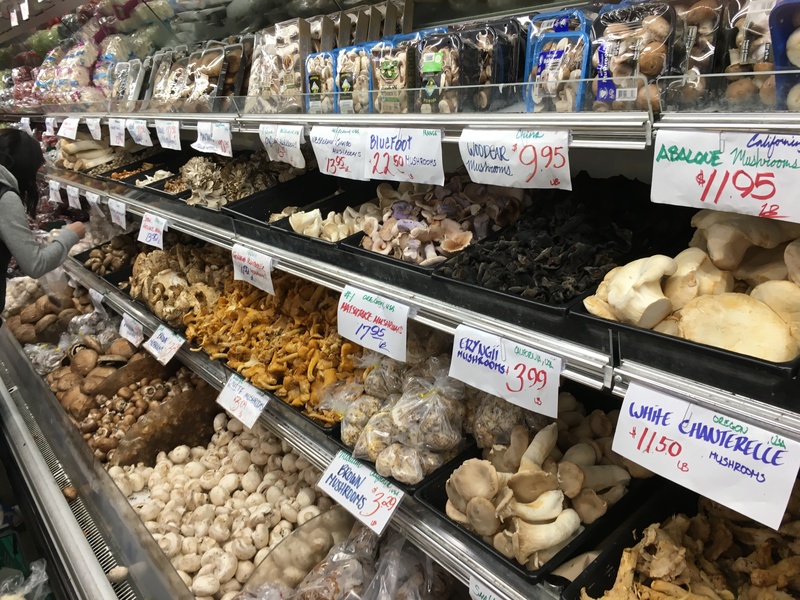 Berkeley Bowl, an Berkeley grocery institution, has a crazy variety of mushrooms, which I’m in the process of exploring, fungus by fungus. And that doesn’t begin to address dozens of cheeses, onions, peppers, pepper jelly, bacon, prosciutto, pork belly…. This is going to be a long and arduous investigation. I’m borrowing heavly from a recipe by Daniel Gritzer. 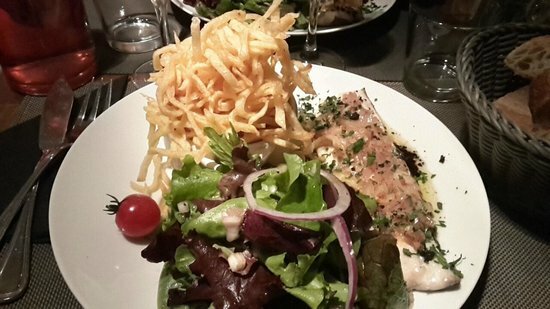 He points out that there is a wide range of opinion, even in France, of what should go into a Salade Nicoise. A real food fight. But since we aren’t in France, I think we can do whatever we want. What I want to add to the conversation, aside from permisson to chart your own course, is some observations on how to treat several of the components. If this is starting to sound like the omelet conversation, I guess that’s what I like about these dishes. 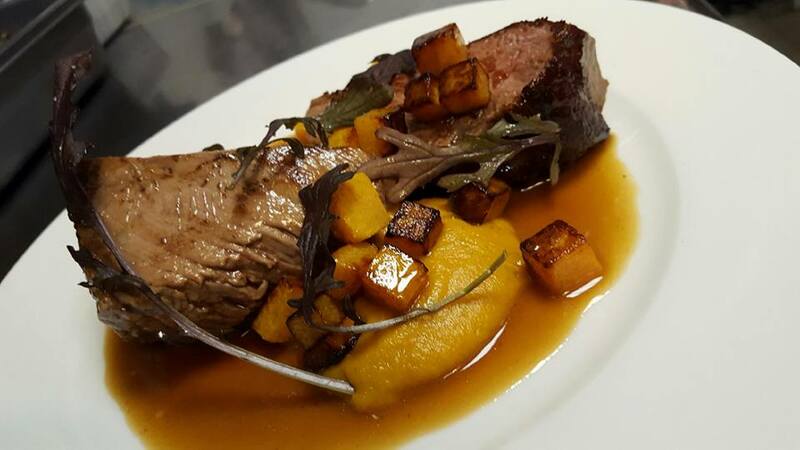 Recipes aren’t ending points, but starting points. There are four parts of the receipe that I think benefit from a little elaboration. 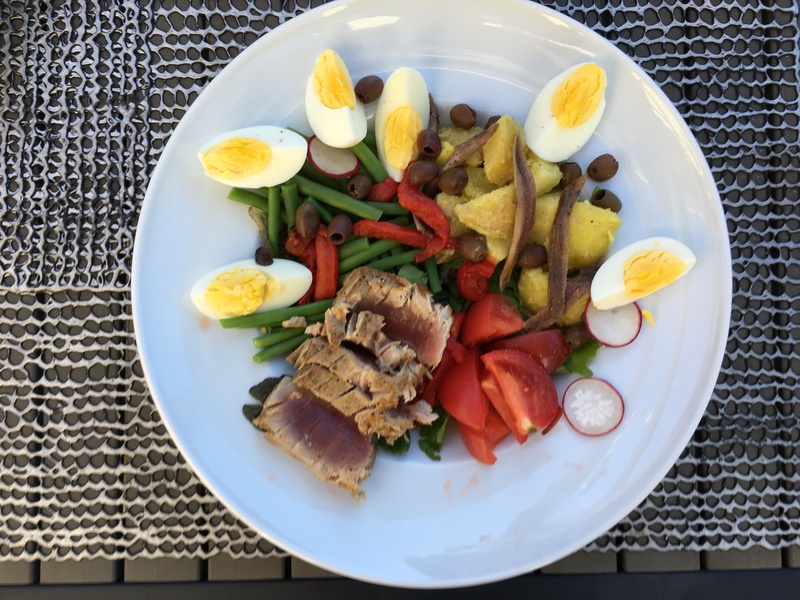 I found that I learned to consistently make a good Salade Nicoise by trying each of the elements until I got them just right and added notes to the recipe. 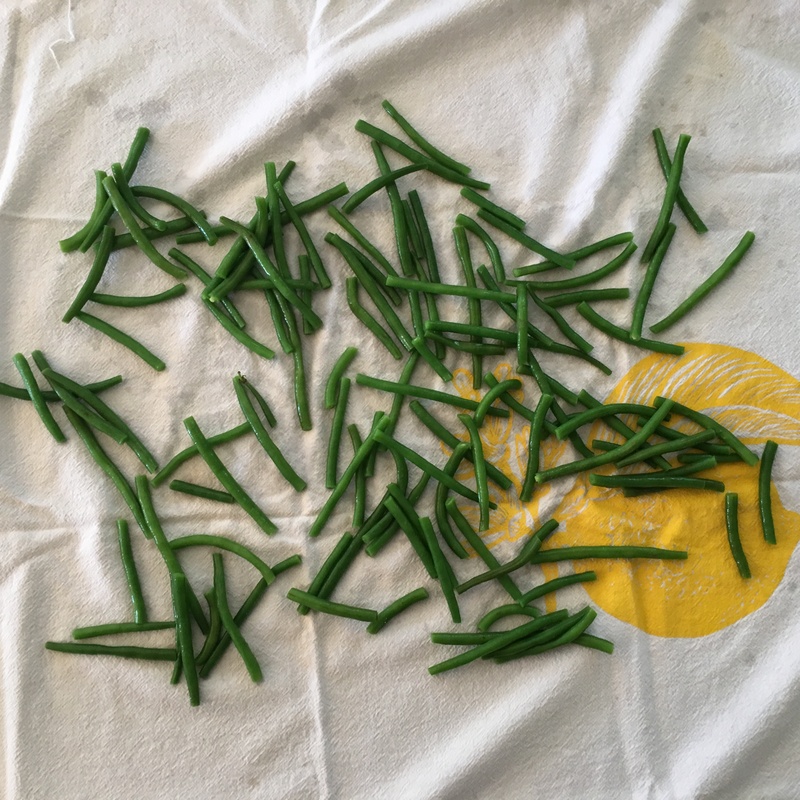 The French green beans: A small handfull per serving. 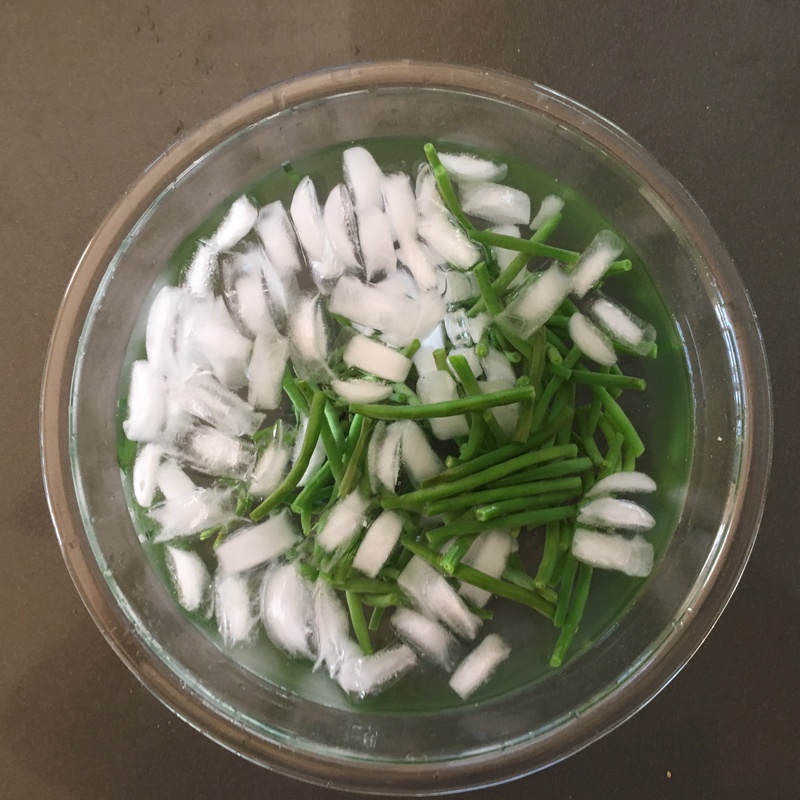 Use the slender french beans cut into bite size pieces. I tried regular green beans, but they are not as sweet. Put the beans into salted boiling but for just over 3 minutes. Try one, they should be crisp. Have a bowl of ice water ready. Drain the beans and plunge into the ice water. Wait until the ice has mostly melted and the beans are cold. Spread out on a towel and cover with another towel to dry until you are ready to put into the salad. They are great just that way and I’ve started to cook some up as snack food. They probably won’t come out just right, but whose to say what’s just right? How much water? What’s a rolling boil? Try a sample. Put three eggs in the water. Pull one out at 4 minutes one at 5 minutes and one at 6 minutes. Keep track of which is which. None may be just what you are looking for but you can interpolate, or is that extropolate. And make a note because, next time you won’t remember. From my test it was 4 1/2 minutes. The Potatoes: You can’t have too many, see below. 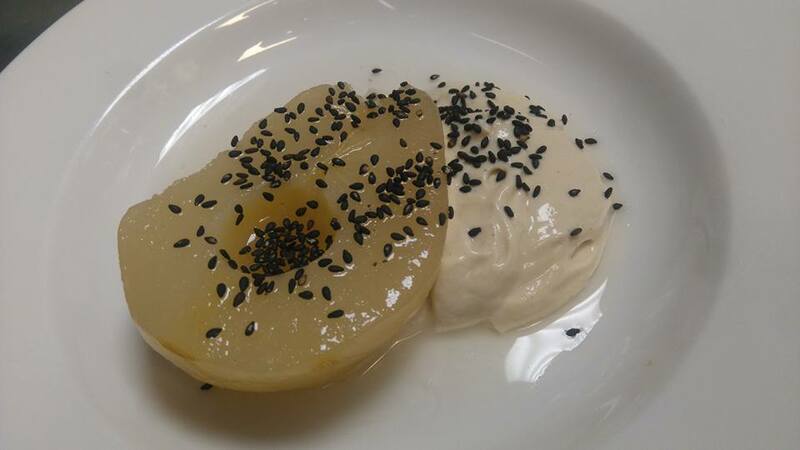 Use small Yukon Gold and cook in heavily salted water with an onion, garlic and anything else that takes your fancy, until they are fork soft and let them cool in the water. You can test from time to see if you want to drain them. They come out creamy and wonderful. Definitely cook too many; they’re great leftovers or fried up. Once you drain them, cut to the size you want and toss the peices in some of the vinaigrette until they’re lightly coated. The Tuna: Half a can or equivalent fresh, or more pre serving. I’m not a purist about the tuna. Canned is just fine, but if you can get sushi grade tuna at a reasonable price, try it. Rub with oil and maybe a little vinaigrette. Sear in a hot skillet, two minutes on a side. Since it’s going to be sliced, cut a piece. You can cook it more or less to your taste. I like spring salad mix but any lettuce, cut small, will work. You can use all or some of these things or add something else. A hand blender is best and worth the investment just for dressings. If you’ve included anchovies in the salad, blending a couple of filets into the dressing will spread the flavor throughout salad. Like the potatoes, there’s no law you can’t make two or even three times what you need, it keeps. You’re proably having salad tomorrow. Arranging: Certainly no rules here, from all mixed up to carefully composed. Dress lightly, maybe before adding the seared tuna and reserve a little vinagrette for the table. Just have fun, and send me photos of your creations. Paris was our last stop on a three week trip. We were ready to be home and had snared last minute first class seats with discount miles on the flight home. I won’t try to tell you that flying first class isn’t great, just a little embarrassing, a privilege we somehow don’t deserve. It’s not like we paid $4,500 for these seats. If we had, we might think, hell yes, we deserve all the pampering. But we just got lucky paid a couple of hundred dollars. When I fly economy I don’t really think of first class, especially when you don’t have to parade past them, lugging your carry-on, while they sip champagne. And in the first class cabin, with only 12 others, you can almost forget the 300 passengers packed in behind you. But in the arrival process the difference between the two is exposed to all. 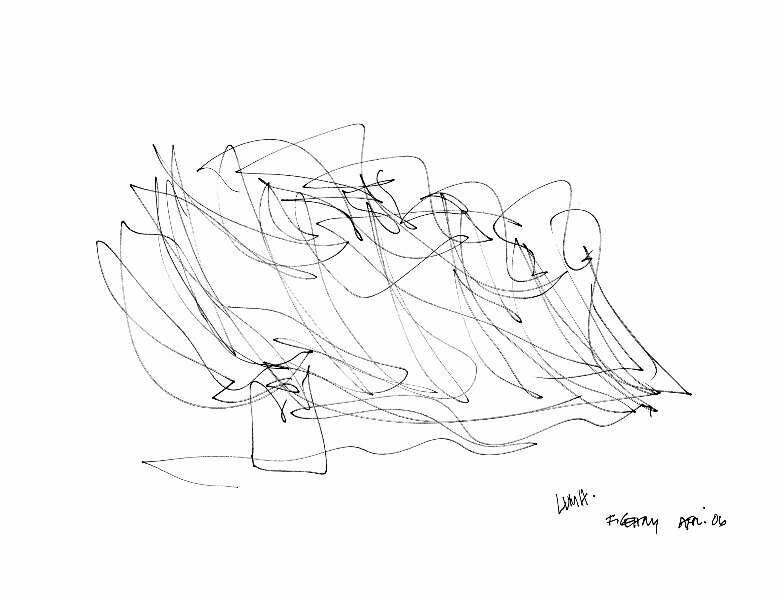 You jump all the queues. At Charles de Gaulle airport, we were presented with two lines at security, one long and one very short behind a gate. To activate the gate, you scanned your boarding pass. There were two groups in front of us, trying that line. Each time, when they scanned their passes, the machine issued a loud annoying buzz, maaaa … rejected! We cautiously stepped up, scanned our passes, and a melodious ringing of bells – angel like – filled the air, the gate opened and we passed through. People in the other line, which wasn’t moving, certainly noticed. We felt only a little guilty.